Our fourth year raising funds for aneurysm research! 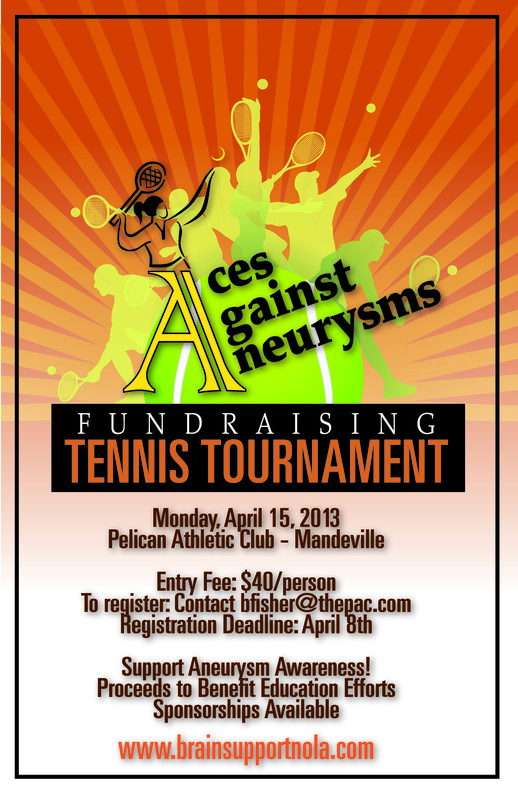 Aces Against Aneurysms, an initiative started by aneurysm survivor Rebecca Winchell, has scheduled its fourth annual tennis tournament for April 15, 2013 at Pelican Athletic Club in Mandeville. Proceeds from the tournament will fund aneurysm medical research. Cost of entering the tournament is $40 and participants must register by April 8 by contacting Barbara Fisher at bfisher@thepac.com. Winchell survived a potentially deadly brain hemorrhage as a result of an aneurysm three years ago and made a promise to raise awareness in the area. 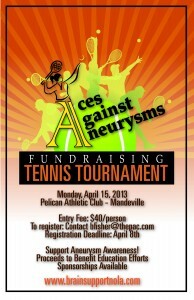 Proceeds from the tennis tournament are earmarked for the National Brain Aneurysm Foundation and aneurysm research. Last year’s tournament raised $10,000 for the National Brain Aneurysm Foundation’s research fund. An estimated 6 million people in the United States have an unruptured brain aneurysm, or 1 in 50 people. The annual rate of rupture is approximately 8 per 100,000 people or about 25,000.